Whenever I see white complexion / glittering eyes / femme fatale, I think 'arsenic and/or belladonna'. It does make one's daily use of a spot of sunscreen and/or moisturizer seem a little dull by comparison! 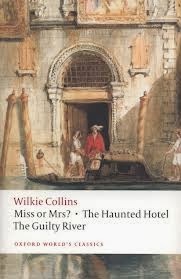 I do like Wilkie Collins a lot - really must read this one now. I have such a soft spot for The Haunted Hotel as it was the book that got me back into reading after my first year studying English at uni. Having to read so many books a week really changed the way I felt about reading for enjoyment but I picked this up and never looked back. And for that reason, I will always love Wilkie. I never fancied studying English for that very reason, my degree was History of Art so fiction remained a happy escape from set texts but I re-discovered Collins at much the same time as you and have loved him very much ever since. It's a novella - just over a hundred pages long and published by Oxford World's Classics with two others ('Miss or Mrs' and 'The Guilty River'). I think they're all available free as e-books, whichever format you prefer it's worth reading.